Wine is a very complex and detailed subject which can be debated at length due to the differing opinions and attitudes. Each individual is different; one person may prefer one thing but might not like another. Just like food, different taste buds and palates mean that the vast quantities and various choices available result in many differing opinions. Improving your wine knowledge and moving from basic terms and understandings to a more in depth and high level takes time, but you certainly can improve. There are many ways to go about this and increase your understanding for all types of wine from every corner of the world. How can I improve my wine knowledge? Drinking wine from different sized and shaped glassware plays a vital part in the taste and enjoyment of wine. The shape and style of the glass dictates whereabouts the wine is directed to within your mouth, but more importantly which part of the palate the wine interacts with first. This is important in a number of ways, because each area on your tongue relates to a different taste bud. 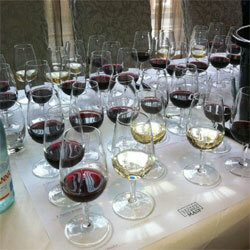 The wine trade use one ‘all-round’ glass for all types of tastings, the ISO style standard 21.5cl Wine Tasting Glass. Why do they only use the one glass I hear you ask? Well, they all use the same glass so that results and opinions aren’t varied because of the glass they are served in. The same wine served in different glassware can provide a completely different result. Purchasing your own set of professional wine tasting glasses will give you a feel of how tasting wine should be structured and how it is performed at the highest levels. The 21.5cl Luigi Bormioli tasting glass will provide a fair and equal assessment. 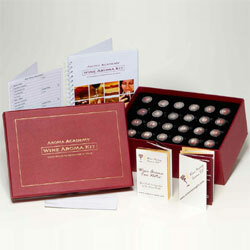 Tasting Aroma Kits tend to be used by the more advanced wine enthusiasts, but that’s not to say that if you’re a wine novice you can’t use one, because you can! Within a tasting aroma kit, you’ll find an array of small different bottles filled with a liquid/scent of different aromas and tastes that you’re likely to find in wine. This works really well when describing which flavours can be found in a particular wine, whether it’s fruity or smoky, or it has a slight vanilla taste about it. We supply both the Le Nez du Vin and Aroma Academy ranges of educational kits, both of which can be purchased in different sized formats. 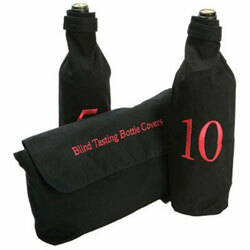 Our set of numbered blind wine tasting covers (1-10) lets you taste wine without knowing anything about the wine! The black covers fit most standard sized wine bottles and are a great way to ‘blind taste’ different wines. This will enhance your wine education and is great for testing your knowledge, whether you’re trying to work out which grape type the wine is made from or even from which country or region the wine originates. They’re easy to use and wash and a blind wine tasting will certainly improve your wine knowledge in an enjoyable and fun way. Reading about any subject will allow you to educate yourself at your own pace and doing this about wine is certainly no different from any other topic. The De Long Wine Book and the Wine Journal educate you with certain wine terms and phrases, as well as informing you about ways to taste wine and the background behind the different tasting techniques. 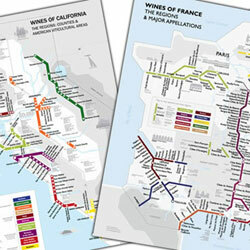 Educating yourself geographically will only help improve your wine knowledge. If you’re interested in a certain wine region or a specific country, our De Long Wine Maps cover the most famous and well respected wine regions of the World. France, Italy, The Iberian Peninsula (Spain & Portugal) and California are all covered at present with several others to come which are already in development. These have all been impeccably and thoroughly researched and are produced to a high specification on beautiful quality paper and the clear and precise readings make them ideal for framing. Click here to find more Wine Education products and ways to improve your wine knowledge with Wineware.